Through five successful editions, LexisNexis® Butterworths Castel & Walker: Canadian Conflict of Laws has provided a scholarly yet practical analysis of the vast and continuously growing body of common law, legislation and treaties and conventions that govern private international law as it is applied in Canada. Walker, Janet. 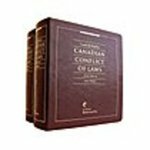 Castel and Walker: Canadian Conflict of Laws, 6th Edition. Markham, ON: LexisNexis Canada, 2005. Print. Walker, Janet, "Castel and Walker: Canadian Conflict of Laws, 6th Edition" (2005). Books. 125.